Artificial intelligence (AI) is a branch of computer science devoted to creating computer systems that perform tasks characteristic of human intelligence. And one of the hottest questions around AI today is who is going to win the global race for AI competitive advantage: the United States or China. Jumping into this debate is Kai-Fu Lee, a Chinese computer scientist. 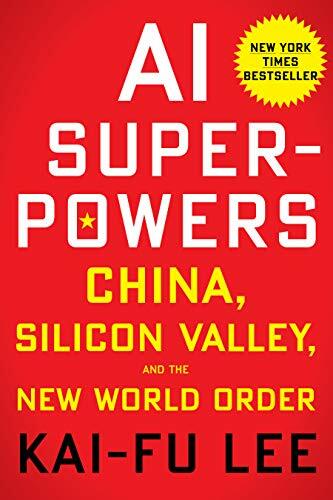 Lee, the author of AI-Superpowers, is head of Sinovation Ventures, a Chinese venture capital firm, and before that was president of Google China. So Lee has both deep understanding of AI and U.S. and Chinese technology companies. AI Superpowers is really two books. The first half of the book, a discussion of AI and the U.S. and Chinese companies competing for advantage, is extremely accessible and informative. The second half, which delves into the economic implications of AI, reinforces my belief that computer scientists should stick to computer science and leave economics to economists. Lee starts by describing how AI—and in particular a branch known as deep learning, which are algorithms that can learn by themselves provided they are exposed to enough data—is being applied especially by the thousands of firms in China today. While he sees AI as being an important innovation, he also rightly throws cold water on the technology-distopians who claim that super-AI that is superior to humans—think The Terminator—is science fiction and at best (or worst) a long way off. Perhaps one of Lee’s most interesting insights is that AI is at a phase where leading-edge discovery—what America has long led in—is less important to than “brute force” advancement. In other words, winning is AI is now not so much about inventions of better AI, but about implementation of existing AI breakthroughs to a vast array of applications. It is here, Lee argues, that China has a distinct advantage, being able to deploy a vast army of “good enough” computer scientists. But while having more data is good, is it always true? At some point more data exhibits laws of diminishing returns. In training an algorithm to recognize a cat instead of a dog, adding another picture to the 1 million already in the system is a lot more useful than adding another to the 1 billion already in the system. Nonetheless, Lee makes an important point: if the United States does not want to fall behind in the race of AI advantage, and lose the good jobs that come with that, it will need to avoid going down the European path of making less data available. Lee’s third factor on why he thinks China will gain advantage over the United States relates to the differences in entrepreneurial capabilities. He rightly claims that Chinese tech entrepreneurs are more aggressive than U.S. ones. But there is a fine line between aggression and cheating. For example, Lee praise Chinese entrepreneurs for “copying,” making it sound endearing as when he calls the Chinese “copykittens.” But what he calls copying is in many cases theft; over $600 billion a year form the United States according to IP Commission Report on the Theft of U.S. Intellectual Property. The reality is that Chinese entrepreneurs built many Internet companies by stealing US intellectual property, violating patents and copyrights, all the while relying on their government to hamstring our outright ban on their U.S. competitors from getting a foothold. For example, when some Chinese firm created a knockoff Disneyland or a Chinese firm made a perfect copy of Google search engine, he glosses over this theft and violation of international trade law by calling it “borrowing.” And when Chinese firms engage in unethical business conduct, including trying to get the government to arrest their competitors, he terms it being a “lean gladiator.” It’s really lacking core moral values that have to govern life and business for a society to work. Lee’s fourth factor is government. He lays out a very interesting dynamic of how the Chinese central government signaled that global mastery of AI was central to China’s future and how that spurred provincial and local government officials, members of the Communist party, to go on a massive spending spree to support AI development, funding firms, creating thousands of AI “incubators,” and using AI in government applications. He rightly contrasts that with the U.S. government’s hands-off approach, which is grounded in the 19th century belief that market forces will ensure AI victory. But while some of these efforts are legitimate and “fair” Lee glosses over how much of what China is doing is violates the letter, if not the spirit of the World Trade Organization. He talks about how the government is seeking to win in semiconductors, and yet ignores how the Chinese got around WTO rules regarding subsidies by setting up a front organization that funnels tens of billions of government dollars to Chinese semiconductor firms. When Lee switches to the economic impacts of AI he quickly goes off track. He starts by assuming that AI will replace about 40 to 50 percent of the jobs in the United States in the next 15 years and that this will lead to massive unemployment—around 20 to 25 percent. Yet most legitimate studies put the former number at between 10 to 25 percent and the latter at less than 8 percent. He goes on to warn of a dystopian world where the proletariat will be impoverished and virtually all the gains will go to a small number of obscenely wealthy tech titans. Here, Lee makes two fundamental errors. The first is what economists call the lump of labor fallacy. This is the view that once a job is gone from automation, it’s gone for good. But the reality is that no company will use AI to cut jobs unless it saves money. And that money doesn’t get buried, it goes to lower price or higher wages, and that money in turn spent by consumers, which in turn means hiring workers to fill that demand. So, while productivity rates may increase somewhat—let’s hope so—the result will not be fewer jobs, just as it has not been for the last 200 years. Lee’s second fundamental mistake is that he believes that competitive markets will be overturned and we will “see greater and greater concentration of astronomical sums in the hands of the few.” But if this is true, why is the rate of business profit largely unchanged over the last half century as productivity has more than doubled? Why didn’t companies gobble up all those savings as profits? For the same reason they don’t raise prices more than they do: competition. This will be no different in the future. Industries transformed by AI, including transportation, health care, financial services, and the like, will still have competition and that will mean widely shared benefits. Reading the first half of AI Superpowers leads one to be optimistic, although if the reader is American to be worried that China will beat us. Reading the second half leads one to be scared out of one’s mind and demand that government through a monkey wrench into the AI machine. Have a 50-50 chance of losing my job and another 50-50 chance of even ever being reemployed? No thanks! Stop the machine. Bring back the Luddites. At a time when we need to do everything possible to raise productivity in order to cope with the massive baby boom retirement wave, fanning the fears of technology is not helpful. It is interesting that according to Lee China seems to be embracing AI fully. Chinese elites are not warning about the potential downsides of AI; they are rightly cheering AI as a progressive force. It is only in the West that the Luddite argument is gaining ground, including through books like AI Superpowers. Robert D. Atkinson's most recent book is Big Is Beautiful: Debunking the Myth of Small Business (MIT Press, 2018). He is a Canadian-American economist who is president of the Washington D.C. public policy think tank, Information Technology and Innovation Foundation.